I have always been in love with writing. Not just any type of writing, but creative writing. This semester, I enrolled in a class here at Saint Rose called Multimedia Storytelling with Professor Liz Richards. Thinking that it would involve a lot of writing, I was really excited to finally have some creative freedom in a class! However, soon came to realize that storytelling does not always entail writing. Upon receiving the syllabus for the class, we were all puzzled as to what the assignment titled “Inflatables Collaboration” would be about. 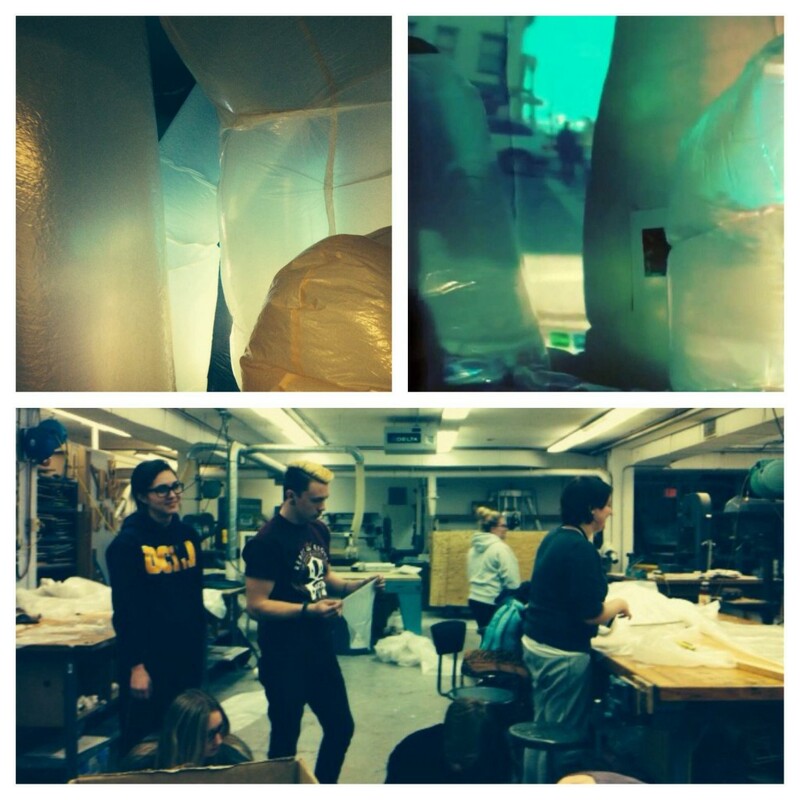 The Inflatables Collaboration began only a few weeks ago with a meeting between the two classes involved: 3-D Concepts, an art class, and Multimedia Storytelling, a communications class. We started with a clean whiteboard and limitless ideas. “What are inflatables?” I thought to myself. My question was soon answered by the 3-D Concepts professor, Susan Meyer. Inflatables are a variation of something called “Installation Art”. This genre of art is incredibly unique in the art world. Installation art allows the artist to fill up an entire room with different mediums. It gets its name for having to be physically installed into the space instead of hung on a wall or displayed in a case. It often times engages the viewers by including visual, audio, and other sensory feelings. There really are no limits. The inflatables that we would be working with would be made out of a plastic sheeting material that would be heated or taped together around a fan to make them inflate: picture crazy inflatable arm flailing balloons outside of car dealerships if you still can’t picture it! During the brainstorming process, it was absolutely amazing to see how different the thought processes were between the art and the communication students. The 3-D Concepts students were extremely detailed in their ideas that they expressed. Emotions and vivid descriptions made their ideas so much more mentally tangible for us communications students to understand. Communication students provided ideas that were a little more traditional and vague. Now, I’m not saying that Communication students are not creative, because we most certainly are. But there was definitely a contrast between the two thought processes which was really interesting to see! We divided up our plans and decided that the art students would create the physical inflatables, and the communication students would separate into groups (documentary, journalist, visual, audio, and public relations). 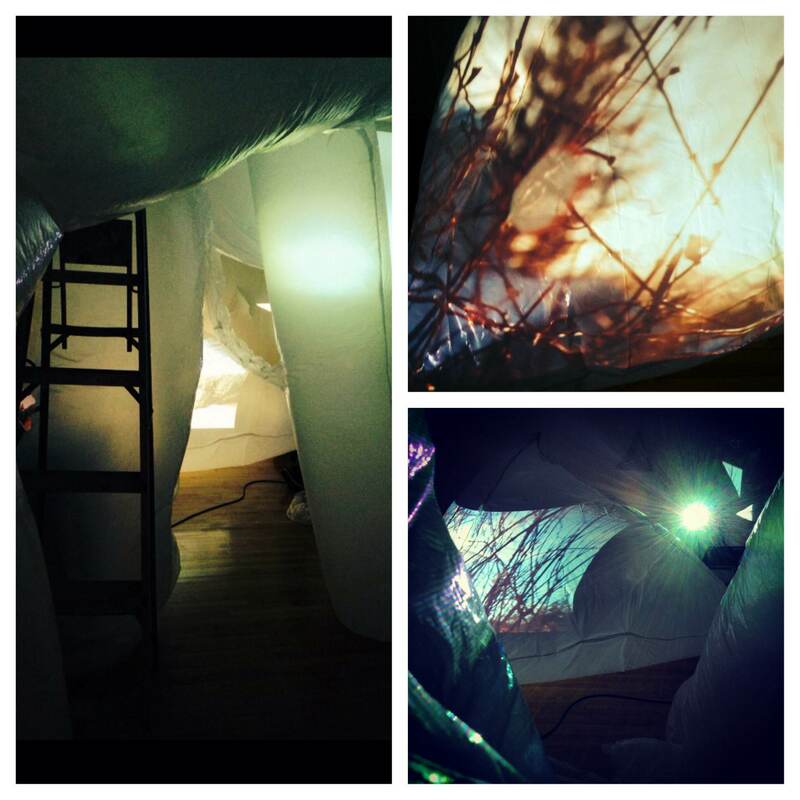 Essentially, art students created the inflatable figures, and we created the visual and audio components that would be projected onto the figures. The documentary team documented both sides and is in the process of creating a mashup of all of their content, explaining both sides of the creative process. The audio and visual teams filmed and recorded different sights and sounds that will be seen and heard in the gallery. The journalist team wrote stories for the school newspaper and radio station, and recorded interviews. Finally, the public relations team (my team! woohoo!) came up with different ways of promoting the art show, wrote press releases, and blew up the event’s hashtag (which is #stroseinflatables, by the way)! Now, I’m not a big art person- I’m creative and abstract when it comes to writing, but when it comes to visual art being abstract, it just never works for me. However, I will say this: Our inflatables project is really really really cool. The colors and sounds projected onto blown up 3-D figures is really amazing. Both classes worked so incredibly hard at this and pushed through even when we were not sure what to expect. At first, I was skeptical and was not sure how two completely different majors would be able to work this out but it happened and the collaboration turned out absolutely stunning! If you are interested, I HIGHLY suggest stopping by the Picotte Student Gallery tonight, April 17th, from 5pm-7pm for the show! It’s going to be a unique, possibly once in a lifetime experience so don’t miss out! Search on Instagram and Twitter #stroseinflatables to find out and see more! See you there!